A Christian heresy which first made its appearance in Novgorod during the reign of Grand Duke Ivan Vassilyevich III. (second half of the fifteenth century), and from there spread to Pskov and Moscow. From the work of the priest Josif Volotzki, entitled "Prosvyetitel," etc. 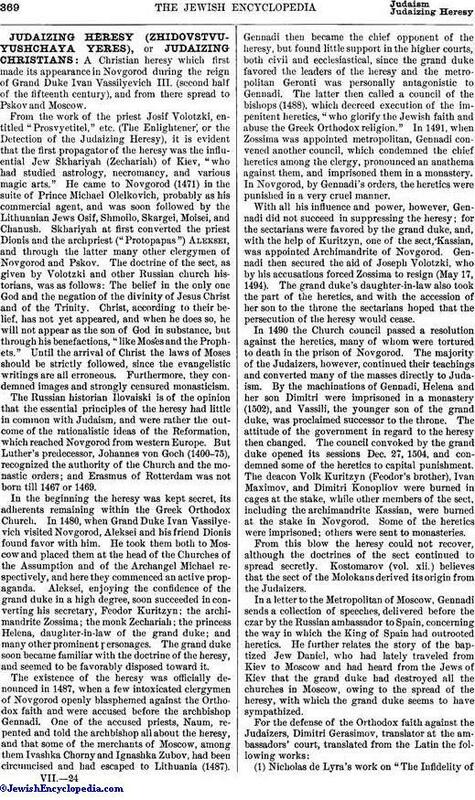 (The Enlightener, or the Detection of the Judaizing Heresy), it is evident that the first propagator of the heresy was the influential Jew Skhariyah (Zechariah) of Kiev, "who had studied astrology, necromancy, and various magic arts." He came to Novgorod (1471) in the suite of Prince Michael Olelkovich, probably as his commercial agent, and was soon followed by the Lithuanian Jews Osif, Shmoilo, Skargei, Moisei, and Chanush. Skhariyah at first converted the priest Dionis and the archpriest ("Protopapas") Aleksei, and through the latter many other clergymen of Novgorod and Pskov. The doctrine of the sect, as given by Volotzki and other Russian church historians, was as follows: The belief in the only one God and the negation of the divinity of Jesus Christ and of the Trinity. Christ, according to their belief, has not yet appeared, and when he does so, he will not appear as the son of God in substance, but through his benefactions, "like Moses and the Prophets." Until the arrival of Christ the laws of Moses should be strictly followed, since the evangelistic writings are all erroneous. Furthermore, they condemned images and strongly censured monasticism. The Russian historian Ilovaiski is of the opinion that the essential principles of the heresy had little in common with Judaism, and were rather the outcome of the rationalistic ideas of the Reformation, which reached Novgorod from western Europe. But Luther's predecessor, Johannes von Goch (1400-75), recognized the authority of the Church and the monastic orders; and Erasmus of Rotterdam was not born till 1467 or 1469. In the beginning the heresy was kept secret, its adherents remaining within the Greek Orthodox Church. In 1480, when Grand Duke Ivan Vassilyevich visited Novgorod, Aleksei and his friend Dionis found favor with him. He took them both to Moscow and placed them at the head of the Churches of the Assumption and of the Archangel Michael respectively, and here they commenced an active propaganda. Aleksei, enjoying the confidence of the grand duke in a high degree, soon succeeded in converting his secretary, Feodor Kuritzyn; the archimandrite Zossima; the monk Zechariah; the princess Helena, daughter-in-law of the grand duke; and many other prominent personages. The grand duke soon became familiar with the doctrine of the heresy, and seemed to be favorably disposed toward it. The existence of the heresy was officially denounced in 1487, when a few intoxicated clergymen of Novgorod openly blasphemed against the Orthodox faith and were accused before the archbishop Gennadi. One of the accused priests, Naum, repented and told the archbishop all about the heresy, and that some of the merchants of Moscow, among them Ivashka Chorny and Ignashka Zubov, had been circumcised and had escaped to Lithuania (1487). Gennadi then became the chief opponent of the heresy, but found little support in the higher courts, both civil and ecclesiastical, since the grand duke favored the leaders of the heresy and the metropolitan Geronti was personally antagonistic to Gennadi. The latter then called a council of the bishops (1488), which decreed execution of the impenitent heretics, "who glorify the Jewish faith and abuse the Greek Orthodox religion." In 1491, when Zossima was appointed metropolitan, Gennadi convened another council, which condemned the chief heretics among the clergy, pronounced an anathema against them, and imprisoned them in a monastery. In Novgorod, by Gennadi's orders, the heretics were punished in a very cruel manner. With all his influence and power, however, Gennadi did not succeed in suppressing the heresy; for the sectarians were favored by the grand duke, and, with the help of Kuritzyn, one of the sect, Kassian, was appointed Archimandrite of Novgorod. Gennadi then secured the aid of Joseph Volotzki, who by his accusations forced Zossima to resign (May 17, 1494). The grand duke's daughter-in-law also took the part of the heretics, and with the accession of her son to the throne the sectarians hoped that the persecution of the heresy would cease. In 1490 the Church council passed a resolution against the heretics, many of whom were tortured to death in the prison of Novgorod. 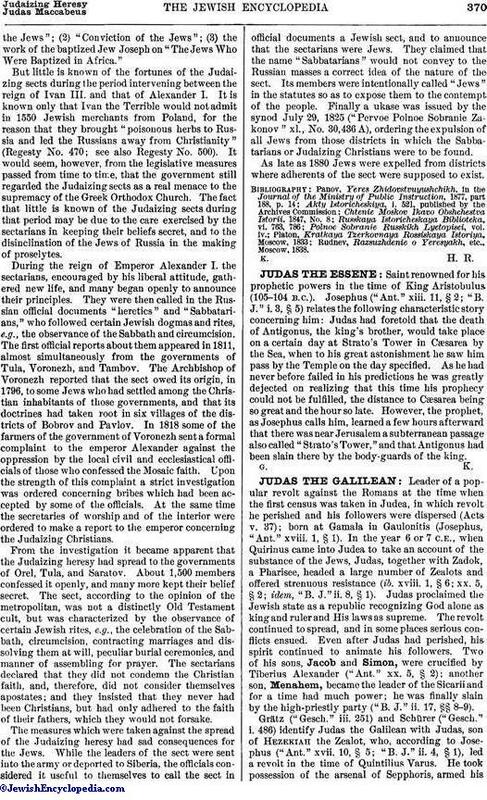 The majority of the Judaizers, however, continued their teachings and converted many of the masses directly to Judaism. By the machinations of Gennadi, Helena and her son Dimitri were imprisoned in a monastery (1502), and Vassili, the younger son of the grand duke, was proclaimed successor to the throne. The attitude of the government in regard to the heresy then changed. The council convoked by the grand duke opened its sessions Dec. 27, 1504, and condemned some of the heretics to capital punishment. The deacon Volk Kuritzyn (Feodor's brother), Ivan Maximov, and Dimitri Konopliov were burned in cages at the stake, while other members of the sect, including the archimandrite Kassian, were burned at the stake in Novgorod. Some of the heretics were imprisoned; others were sent to monasteries. From this blow the heresy could not recover, although the doctrines of the sect continued to spread secretly. Kostomarov (vol. xii.) believes that the sect of the Molokans derived its origin from the Judaizers. In a letter to the Metropolitan of Moscow, Gennadi sends a collection of speeches, delivered before the czar by the Russian ambassador to Spain, concerning the way in which the King of Spain had outrooted heretics. He further relates the story of the baptized Jew Daniel, who had lately traveled from Kiev to Moscow and had heard from the Jews of Kiev that the grand duke had destroyed all the churches in Moscow, owing to the spread of the heresy, with which the grand duke seems to have sympathized. (1) Nicholas de Lyra's work on "The Infidelity ofthe Jews"; (2) "Conviction of the Jews"; (3) the work of the baptized Jew Joseph on "The Jews Who Were Baptized in Africa." But little is known of the fortunes of the Judaizing sects during the period intervening between the reign of Ivan III. and that of Alexander I. It is known only that Ivan the Terrible would not admit in 1550 Jewish merchants from Poland, for the reason that they brought "poisonous herbs to Russia and led the Russians away from Christianity" (Regesty No. 470; see also Regesty No. 500). It would seem, however, from the legislative measures passed from time to time, that the government still regarded the Judaizing sects as a real menace to the supremacy of the Greek Orthodox Church. The fact that little is known of the Judaizing sects during that period may be due to the care exercised by the sectarians in keeping their beliefs secret, and to the disinclination of the Jews of Russia in the making of proselytes. During the reign of Emperor Alexander I. the sectarians, encouraged by his liberal attitude, gathered new life, and many began openly to announce their principles. They were then called in the Russian official documents "heretics" and "Sabbatarians," who followed certain Jewish dogmas and rites, e.g., the observance of the Sabbath and circumcision. The first official reports about them appeared in 1811, almost simultaneously from the governments of Tula, Voronezh, and Tambov. The Archbishop of Voronezh reported that the sect owed its origin, in 1796, to some Jews who had settled among the Christian inhabitants of those governments, and that its doctrines had taken root in six villages of the districts of Bobrov and Pavlov. In 1818 some of the farmers of the government of Voronezh sent a formal complaint to the emperor Alexander against the oppression by the local civil and ecclesiastical officials of those who confessed the Mosaic faith. Upon the strength of this complaint a strict investigation was ordered concerning bribes which had been accepted by some of the officials. At the same time the secretaries of worship and of the interior were ordered to make a report to the emperor concerning the Judaizing Christians. From the investigation it became apparent that the Judaizing heresy had spread to the governments of Orel, Tula, and Saratov. About 1,500 members confessed it openly, and many more kept their belief secret. The sect, according to the opinion of the metropolitan, was not a distinctly Old Testament cult, but was characterized by the observance of certain Jewish rites, e.g., the celebration of the Sabbath, circumcision, contracting marriages and dissolving them at will, peculiar burial ceremonies, and manner of assembling for prayer. The sectarians declared that they did not condemn the Christian faith, and, therefore, did not consider themselves apostates; and they insisted that they never had been Christians, but had only adhered to the faith of their fathers, which they would not forsake. The measures which were taken against the spread of the Judaizing heresy had sad consequences for the Jews. While the leaders of the sect were sent into the army or deported to Siberia, the officials considered it useful to themselves to call the sect in official documents a Jewish sect, and to announce that the sectarians were Jews. They claimed that the name "Sabbatarians" would not convey to the Russian masses a correct idea of the nature of the sect. Its members were intentionally called "Jews" in the statutes so as to expose them to the contempt of the people. Finally a ukase was issued by the synod July 29, 1825 ("Pervoe Polnoe Sobranie Zakonov" xl., No. 30,436 A), ordering the expulsion of all Jews from those districts in which the Sabbatarians or Judaizing Christians were to be found. As late as 1880 Jews were expelled from districts where adherents of the sect were supposed to exist. Rudnev, Razsuzhdenie o Yeresyakh, etc., Moscow, 1838.